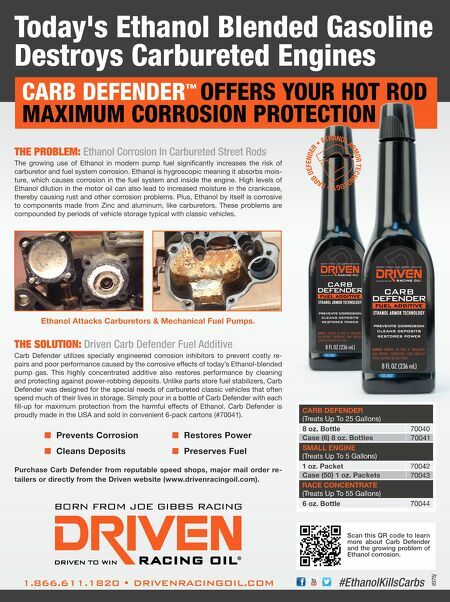 8 n Performance & Hotrod Business n December 2014 n Performance news What's new with you? Mail your news items to Performance News at Performance Business Magazine, PO Box 1416, Broomfield, CO 80038; fax us at (303) 469-5730; or email pbeditor@nbm.com. Covercraft Celebrates 50 years in Business Covercraft Industries, Pauls Valley, Oklahoma, is gearing up to cel- ebrate 50 years in business in 2015. The car cover company is cel- ebrating with its latest line of protective products for cars, trucks and SUVs including: limited edition 50th anniver- sary Ford Mustang products, a full line of indoor and outdoor custom-fit automotive covers, the Covers for Causes line, Carhartt SeatSavers, Colgan Custom car bras, DashMat dash covers, Premier Custom floor mats, UVS100 Sunscreens and Canine Covers pet protection products, accord- ing to a press release. 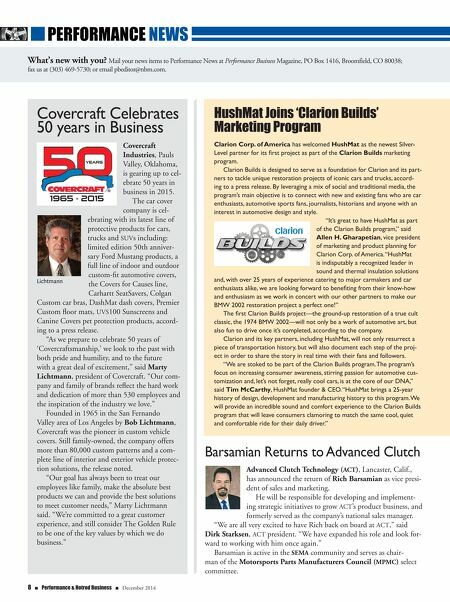 "As we prepare to celebrate 50 years of 'Covercraftsmanship,' we look to the past with both pride and humility, and to the future with a great deal of excitement," said Marty Lichtmann, president of Covercraft. "Our com- pany and family of brands reflect the hard work and dedication of more than 530 employees and the inspiration of the industry we love." Founded in 1965 in the San Fernando Valley area of Los Angeles by Bob Lichtmann, Covercraft was the pioneer in custom vehicle covers. Still family-owned, the company offers more than 80,000 custom patterns and a com- plete line of interior and exterior vehicle protec- tion solutions, the release noted. "Our goal has always been to treat our employees like family, make the absolute best products we can and provide the best solutions to meet customer needs," Marty Lichtmann said. "We're committed to a great customer experience, and still consider The Golden Rule to be one of the key values by which we do business." Lichtmann Hushmat Joins 'clarion Builds' marketing Program Clarion Corp. of America has welcomed HushMat as the newest Silver- Level partner for its first project as part of the Clarion Builds marketing program. Clarion Builds is designed to serve as a foundation for Clarion and its part- ners to tackle unique restoration projects of iconic cars and trucks, accord- ing to a press release. By leveraging a mix of social and traditional media, the program's main objective is to connect with new and existing fans who are car enthusiasts, automotive sports fans, journalists, historians and anyone with an interest in automotive design and style. "It's great to have HushMat as part of the Clarion Builds program," said Allen H. Gharapetian, vice president of marketing and product planning for Clarion Corp. of America. "HushMat is indisputably a recognized leader in sound and thermal insulation solutions and, with over 25 years of experience catering to major carmakers and car enthusiasts alike, we are looking forward to benefiting from their know-how and enthusiasm as we work in concert with our other partners to make our BMW 2002 restoration project a perfect one!" The first Clarion Builds project—the ground-up restoration of a true cult classic, the 1974 BMW 2002—will not only be a work of automotive art, but also fun to drive once it's completed, according to the company. Clarion and its key partners, including HushMat, will not only resurrect a piece of transportation history, but will also document each step of the proj- ect in order to share the story in real time with their fans and followers. "We are stoked to be part of the Clarion Builds program. The program's focus on increasing consumer awareness, stirring passion for automotive cus- tomization and, let's not forget, really cool cars, is at the core of our DNA," said Tim McCarthy, HushMat founder & CEO. "HushMat brings a 25-year history of design, development and manufacturing history to this program. We will provide an incredible sound and comfort experience to the Clarion Builds program that will leave consumers clamoring to match the same cool, quiet and comfortable ride for their daily driver." Barsamian Returns to Advanced Clutch Advanced Clutch Technology (ACT), Lancaster, Calif., has announced the return of Rich Barsamian as vice presi- dent of sales and marketing. He will be responsible for developing and implement- ing strategic initiatives to grow ACT's product business, and formerly served as the company's national sales manager. "We are all very excited to have Rich back on board at ACT," said Dirk Starksen, ACT president. "We have expanded his role and look for- ward to working with him once again." Barsamian is active in the SEMA community and serves as chair- man of the Motorsports Parts Manufacturers Council (MPMC) select committee.